You can see from the list above how I came up with the idea for this card. A sketch, and 2 themes. I used 4 ink pads to create this tree. Starting with the lightest color and tapping the corner of the ink pads in different spots on the stamp, then a light spritz with water and stamp. I got a pretty fall tree. Usually when you think of fall blooms you think of flowers, but acorns are fall blooms also and the beautiful leaves changing colors are as pretty as any flower to me. 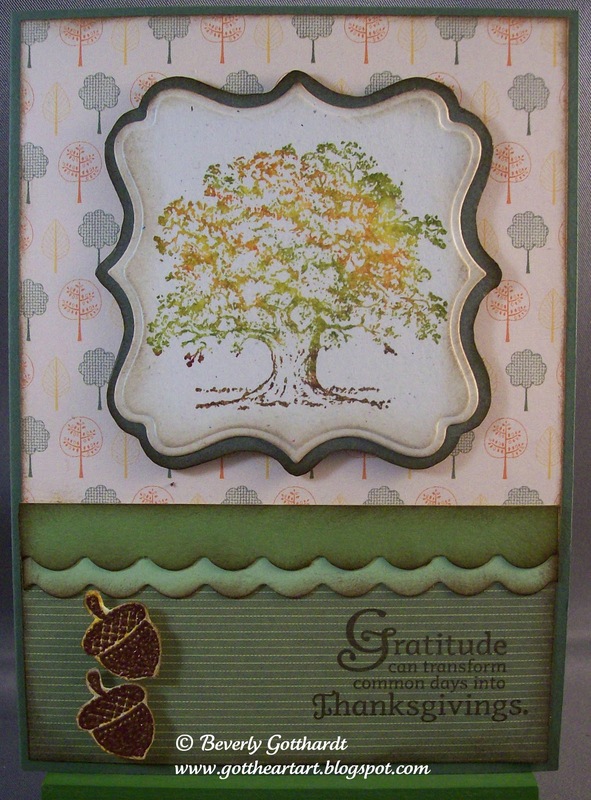 Supplies: 4" X 5 1/2" Always Artichoke card blank, Papers: Stampin Up-Always Artichoke, Naturals card stock, Old Olive, Certainly Celery, Welcome Neighbor Designer Series Paper Pad, Stamps: Stampin Up-Lovely As A Tree, Day of Gratitude, Inks: Stampin Up-Soft Suede, Old Olive, Tangerine Tango, Crushed Curry, VersaMark Ink, Judi-Kins copper embossing powder, Fiskars-Scallop Sentiment border punch, Spellbinders Nestabilities-Labels Sixteen, Stampin Up dimensionals. Beautiful card. Thanks for joining us at Do You Stack Up. your tree colors are beautiful! Thanks for joining us at Blogger's Challenge this week! I really like the simple elegance of this card! Thanks for joining us at DYSU this week! This is simply gorgeous! 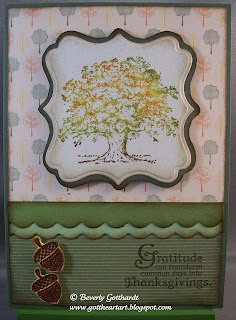 I love that tree image, the colours, and that beautiful sentiment! Thanks for joining us, this week, over at DYSU! Beautiful Fall Leaves - one of my favorite SU stamps! Thanks so much for playing along with the Bloggers Challenge! Wonderful. That image is one of my favorites. The colors you used are perfect for the season.